Dell has announced Latitude 5285 2-in-1 laptop for business at CES 2017, It offers a 12.3-inch full-HD (1920x1080 pixels) touch display with Corning Gorilla Glass protection, and a choice of seventh-generation Intel Core processors coupled with Intel HD Graphics 620. On RAM it has a 4GB of 1866MHz LPDDR3 RAM, going up to 16GB on request with storage up to 256GB M.2 SATA SSD, up to 1TB PCIe NVMe M.2 SSD, or up to 512GB PCIe OPAL M.2 SED. The tablet section features an 8-megapixel rear camera and a 5-megapixel front-facing camera. Ports on the tablet include two USB Type-C ports, one USB 3.0 port, 1 microSD card reader, 1 Micro-SIM slot (in some models), and a port for the travel keyboard. The Latitude 5285 2-in-1 tablet weighs less than 910 grams and measures 292x208.8x9.76mm. Connectivity options on the base model include Wi-Fi 802.11ac and Bluetooth v4.1, and the company is offering optional mobile broadband with Qualcomm and Dell modems. Dell is also touting a stereo speaker configuration with Waves MaxxAudio Pro processing. Optional security features for the Dell Latitude 5285 2-in-1 include an optional FIPS 201 Smartcard reader, touch Fingerprint reader, contactless SC Reader/NFC, Control Vault 2.0 Advanced Authentication with FIPS 140-2 Level 3 Certification, TPM2.0 FIPS 140-2 Certified, TCG Certified, as well as optional DellData Protection and Management Software such as Endpoint Security Suite Enterprise, Threat Defense, Protected Workspace, Secure Lifecycle, MozyPro, and MozyEnterprise. Users have the option of a 31.5Whr or 42Whr battery, alongside the choice of a 45W or 65W adapter. The Dell Latitude 5285 2-in-1 offers the "ultimate in 2-in-1 mobility", and is designed to be "powerful, secure and last all day." 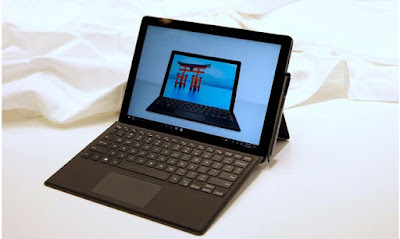 Touting its light weight of less than 1.23kg including the optional travel keyboard and the power of a seventh-generation Intel Core processor, the company says the laptop offers the "the performance of a laptop and flexibility of a tablet." The tablet half comes with an 'auto-deploy kickstand'. Dell Latitude 5285 2-in-1 laptop for business. Priced starting $899 (roughly Rs. 61,500), the laptop will be available from February 28.